In the harrowing adventure called Risks of Vacuuming a Car, I recounted the near tragedy of Miss Sugar losing her purse by leaving it at a carwash. In this post, I will better describe the purse which is the main subject of that prior blog. Living in the shadow of Sugar’s fame, some of my talents are not known to the general public. Among my talents is purse design. So far, I have only designed one. So far, so good. 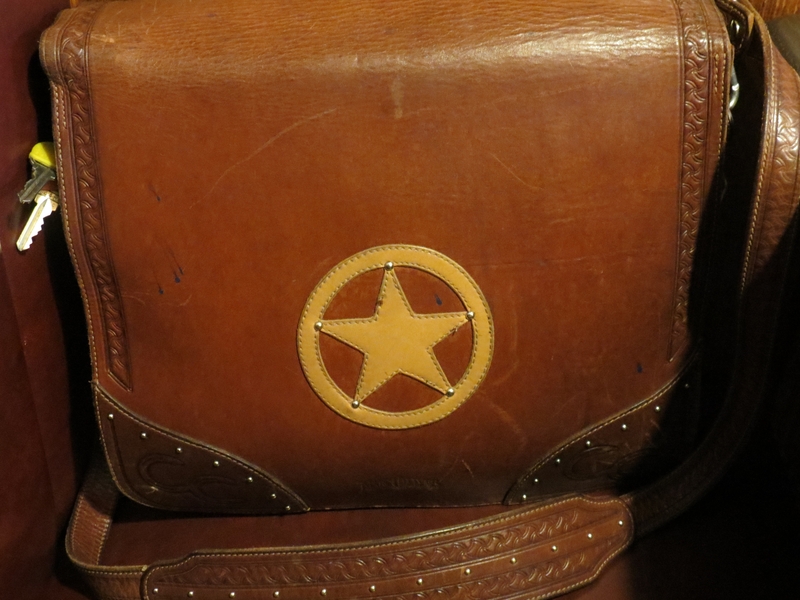 Pictured below are the two sides of Sugar’s purse that I designed to look like a saddlebag with symbolic decorations, such as a Texas star, the name Cross Creek Ranch, our registered brand (open A, cross, reverse C) and a CC logo. A saddlemaker did it for me to give her as a Valentine present a few years back. 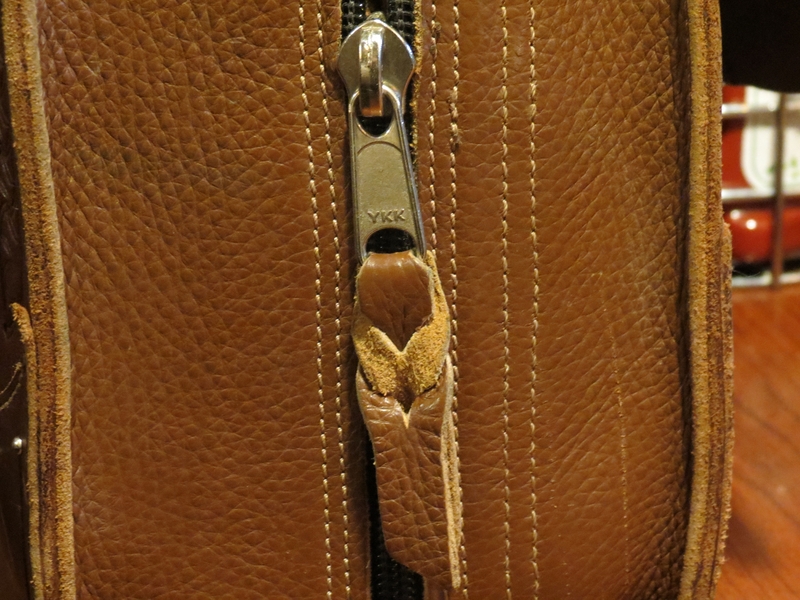 You might have a similar purse, but does your purse also include a hidden compartment for a concealed carry revolver? Consequently, Sugar’s purse, though beautiful to look at, can be heavy to carry, so heavy that our friend who is an orthopaedic surgeon, upon examining it, recommended that I carry it rather than the more delicate Miss Sugar. Nevertheless, she seldom calls on me to do so. Thank goodness! And for your information, men carrying shoulder bags is very European, very metrosexual. The fashion just hasn’t caught on yet around these here parts. So we were walking around Hill City, South Dakota, which is near Sturgis, the motorcycle mecca, and as we were in front of a biker bar, I offered to carry the heavy purse because Sugar had been carrying it for quite a distance. After that, he shut up. You should have seen the fear in his biker eyes. By the way, I was wearing a darling outfit comprised of a cowboy hat, western shirt, boots, and jeans. Unfortunately, that purse/saddlebag did not match my black belt and boots. Still, in accessorizing, can’t one mix black and brown? Maybe the biker noticed the color discrepancy, which would explain his sarcastic tone. If you get an outfit, you can be a cowboy too. You will look amazing. Miss Sugar was concerned about the untidiness of our car. She directed me to go to the vacuum by the automatic car wash where we had just purchased gasoline. There are no attendants. Customers punch in a code after purchasing a car wash at the convenience store/gas station/car wash. You can even pay at the pump. That is, as I said, for a car wash. You can’t pay for using the vacuum that way. The vacuum operates on quarters. We needed six of them to pay the $1.50 minimum amount of time on the vacuum. Sugar searched her purse for quarters as she stood outside the car by the vacuum. She was successful. She inserted the quarters and we each vacuumed a side of the interior of the car. Then we left. No woman wants to lose her purse, but Sugar especially treasures this particular purse. It was a Valentine Day present from me a few years ago. I designed it and then had a saddle-maker actually make it. 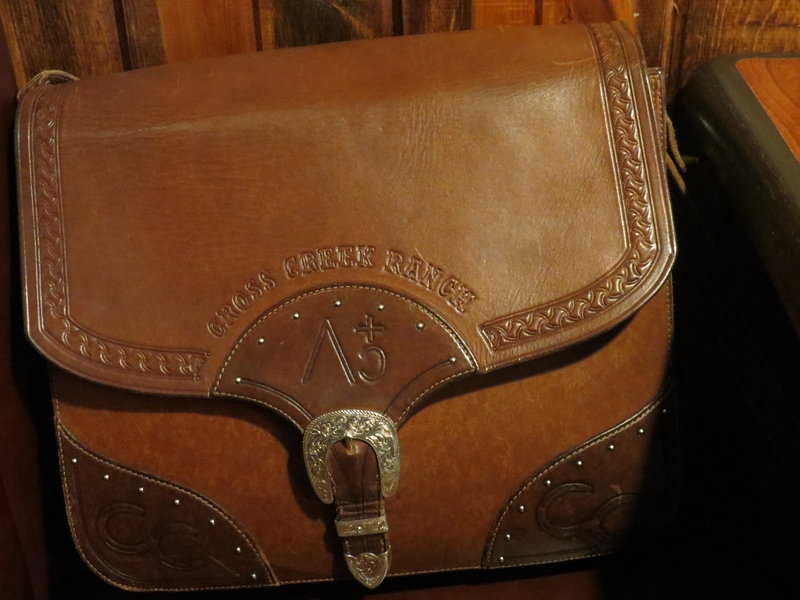 It looks like half of a saddlebag. It has our ranch brand on it as well as a Texas star. Sugar gets lots of compliments on it. I made a quick U-turn and headed back toward the car wash.
On the way, Sugar lamented. We got back to the vacuum and, to our relief, the purse was still there, right where it was left. All’s well that ends well. Plus, we have a cleaner car. When I see something in the news about a tsunami in faraway lands, I have compassion for the victims, but the victims are strangers to me and I have never been to those places. When there is a natural disaster, such as tornadoes in the Midwest or hurricanes on the Gulf Coast, or wildfires in the West, I can relate better. The victims are Americans, like me. Maybe I have been to the location of the disaster. Maybe I have friends or family in the area. But enough about people I don’t know. Now let’s talk about me, me, me. Now the news is showing the clean-up from the flooding in northern Colorado. This is my neighborhood. I have been on those roads now destroyed, like Highway 34 up the Big Thompson Canyon to Estes Park. I can’t get to Estes now. I love going to Estes Park. It is a beautiful little tourist town in the mountains, the gateway to Rocky Mountain National Park. We camped there this summer. My wife did an art show there in June. We have been to the stores shown on the news as being flooded. We live in the very same county. We have family members in Boulder and Longmont. They were not harmed, yet we worried until we learned that. I called a lawyer friend last week to see how he was doing because he lives in an area that is a mountain valley. Last summer, his family was evacuated during the High Park fire. This year his family was not evacuated, but his home was damaged by some of the flooding. Still, they stayed. The road to his house is not a priority in the rebuilding efforts. He was told that it might not be repaired for a year. In the meantime, he literally has to use a ladder to cross a washed out section of the road that is now an open crevice in order to get to a car he parks on the road. He has to hike quite a ways to get to that car. For a year? We have been to his home. It is in a lovely setting. I understand why they moved there. Now I have difficulty grasping how they can stay there, cut off from vehicle access. There are many stories like that. Worse stories. True stories. The people who lost everything in a tsunami can feel compassion for families like my friend’s, and probably do. Even so, Colorado is a faraway place to them. It helps to remember that God, who knows when a sparrow falls from a tree, is here and was there with the people in the tsunamis, the hurricanes, the tornadoes, the wildfires, and the floods. For nothing can separate us from the love of God. The photo above was not staged. I grabbed a camera while Beau was still in the truck. Beau has no defense. We decided that we might enjoy heat during the up-coming winter. We have a hot water radiant heat system. When the thermostats were turned up, we could hear the boiler clicking to kick in, but it never did. So we called a plumber with expertise with boilers. I know what you are thinking — why didn’t Sugar fix it? 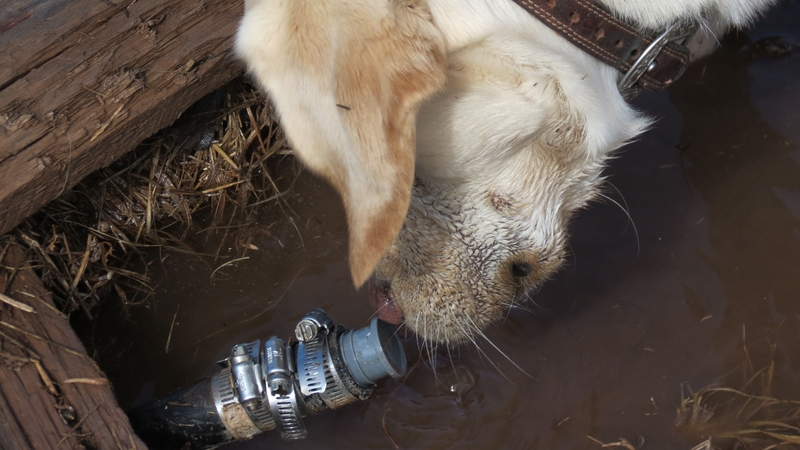 Those of you who read my post called Do It Herself Plumbing (https://cowboylawyer.wordpress.com/2013/05/18/do-it-herself-plumbing/) are aware of Sugar’s handyman talents. Well, she tried before calling the plumber out of frustration. She went on-line and found the brand of boiler that we have and looked at the owner’s manual. She diagnosed the problem as stemming from some by-pass thing-a-ma-bob. She was fixin to order the part when I intervened by doing my own on-line research of plumbers who specialize in hot water radiant heat systems. So I called the plumber, whose name is Jim, and he came out yesterday. No disrespect to Sugar, but it turned out to not be the bypass valve. Rather, the zone valves for the zones needed replacing as well as some corroded re-fill pipe. Just as I thought! I know what you are thinking — why didn’t Beau fix it? Those of you who read my posts called The Usual Suspect (https://cowboylawyer.wordpress.com/2013/03/13/the-usual-suspect/) and Beau Helps Sugar (https://cowboylawyer.wordpress.com/2013/08/06/beau-helps-sugar/) are aware of Beau’s handyman talents. Well, Beau did help. Sort of. Or not. He did accompany us into the crawl space wherein the boiler resides. So did Sadie, our other Yellow Labrador Retriever. So did the cat. Jim didn’t complain, but I’m not sure he appreciated their advice. I could see it in his eyes. Now we have heat. Thanks, Jim! Thanks, Sugar! Thanks, Beau! Thanks, Sadie! Thanks, Simba! History, literature, movies, and music include many stories, some even true, about courage. People admire courage, and should. Americans pride themselves on facing adversity with bravery. In Western lore, we have many examples, both fact and fiction, about native people, mountain men, pioneers, and cowboys, who were either fearless or overcame fear, which is probably even more admirable. We have very recent examples of Coloradans bravely contending with wildfires last summer and now floods as have not occurred in Colorado for 100 or even 500 years. Apparently, this is no place for sissies to live. The flooding in Colorado this week has been and, as I write this, is still a dangerous and destructive enemy. We pray for the many who have suffered damage to homes and businesses and the many involved in rescuing the stranded and helping clean up and rebuild. These folks have demonstrated that they don’t scare easy. Or quit. God bless them! This was the year that my wife, Sugar, had to renew her Colorado driver’s license, so I accompanied her to the appropriate government office. Sugar took a number at the door, #341, and awaited her turn. She made friends with another lady there, who said it took her three hours to get her license. She must have been exaggerating. I made a mental note to counsel Sugar about choosing her friends wisely and to beware of pathological liars. It was apparent to me that we would not be there long. They were already up to #297. In order to renew one’s license, one must bring documentation other than one’s expiring license, which documentation must document one’s current address. So, when it was Sugar’s turn to go to window #8, she showed the young man our electric bill from REA mailed to our P.O. box. She also had her Colorado Teacher’s Certificate, which had been mailed to the same P.O. box. The young man, trained to ensure that no imposter be granted a driver’s license in Sugar’s name, disapproved these as documentation because they only showed our post office box number. Sugar called me to the window, asking if my driver’s license, which is in good standing, had our county road address or just our P.O. box address. Mine has both, I proudly showed the young bureaucrat. Apparently, others have tried to pull this stuff, using one’s spouse with an identical address to prove one’s own address. And who is to say that I am her spouse? See, we did not bring in our marriage license, so I might have been an imposter that claimed to be married to her and to have the same P.O. box AND physical address, yet really only had the real husband’s driver’s license, by, say, picking his pocket. Since my photo is on my license, this scheme would only work if the imposter looked like me, which, I might add, would be virtually impossible because very few members of the general public are as photogenic as yours truly. Nevertheless, the guy behind the counter was wary. Perhaps he has seen many frauds sit in the waiting room with women for hours, pretending to be married, so as to present a stolen license with an altered photo in order to meet the requirement of proving a current address. And if some people did go to all that trouble to provide a false address — what would be the purpose? I am guessing that most of us want our correct address on our driver’s licenses. We showed him our checkbook. The checks have our P.O. box as our address. He suggested I go to the car to get our vehicle registration. Sugar told him that it probably only has our P.O. box. So I went to the car, got the registration, and, sure enough, it only had the P.O. box. Sugar explained that we get our mail delivered at the post office for the reason that the U.S. Postal Service does not deliver mail to our ranch. Truly, you cannot use Mapquest or Google Maps to find our ranch. Once we called the Sheriff and he could not find us at the very address assigned to our place by the county. Apparently, our road address was incorrectly entered into the world of G.P.S. There are satellite photos of our ranch. You can see it from space, just not from the local Post Office. It is easy to find, just not by sheriffs or mailmen. Therefore, all categories of documents suggested by the state as identification showing one’s address, such as utility bills and bank statements, are mailed to our mailing address, which, if you still are with me, is our post office address. This is called circular logic. I was thinking of going to the courthouse to get a copy of the deed to the ranch, which has a physical address with a road number and a lengthy legal description, but by this time, Sugar lost her place in line. I went back to the car. (I had plenty of time to kill.) Digging through the glove box, I found no gloves, but I found our temporary registration when we bought the car years ago. That piece of paper, issued by the State of Colorado via the dealer, who probably asked for our address and relied upon merely the spoken word, happened to have both our P.O. box and OUR PHYSICAL ADDRESS. Yippee! The problem was, there was a sticky sticker stuck on the temporary registration from years of close contact within the glove box, which was the sticker with the price and options. I tried to remove the sticker from the temporary registration but quit when that action appeared to be ripping the registration at the place where our “street” address was written. I brought the registration and the attached sticker into the State of Colorado, Department of Revenue, Division of Motor Vehicles office. As I said, Sugar had lost her place in line. We got there initially at 10:30 a.m. Now it was 12:30 p.m. I decided that Sugar’s new friend might have been accurate in her report of time spent there after all. After a wait, the young man at window #8 had mercy and called us back up. I presented the temporary registration where you could kinda see the county road number if you barely pull back the sticker. He told me he could not read it. Then Sugar smiled her beauty pageant winner smile and told him that it was her birthday, which is why she came in to make sure she did not drive on an expired license for even one day. The state official asked her to tell him the address that he could not read, so she did, and he put that on her new license. I guess I did not smile charmingly enough. The guy at window 8 took a chance that Sugar was not fooling about where she lives. We still had to wait for her to get her photo taken and fingerprints taken. The photo session went fine. It seems they believed that was Sugar’s real face. The finger print guy could not get a print after four tries. For some reason, perhaps a trick she picked up from the Mafia, being of Italian heritage and all, Sugar has fingerprints that do not show up. Maybe she burned them off using some bad stuff as an art teacher. She would have an advantage as a burglar. When she renewed her teaching license, we had the same problem. So the nice fingerprint guy checked something on the computer showing she had no criminal record and that her prints from before did not show up either. Sugar is supposed to get the license in the mail within 30 days. 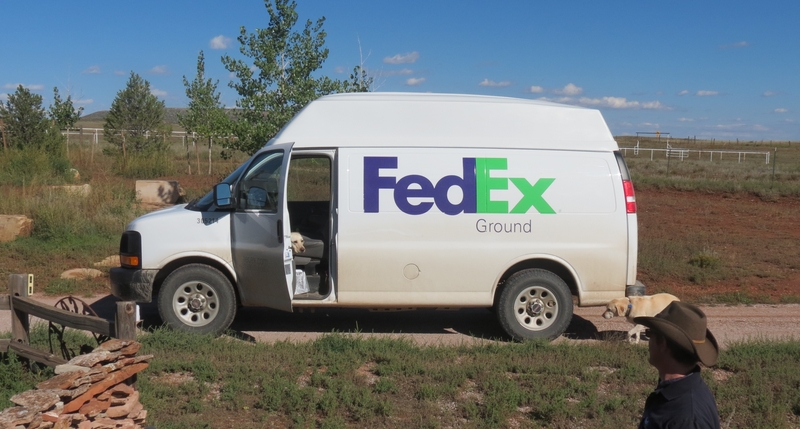 I sure hope they mail it to the P.O. box or we will never get it. Like we told the guy at window #8, they don’t deliver mail to our ranch. We tried to do just that. Sugar and I have invited outsiders to pay us for coming to our ranch for various purposes that, until now, involve horses. For example, we have boarded horses, taken people for trail rides, given riding lessons, and hosted birthday parties for kids at which the attendees got to ride horses led in the arena. We have a horse hotel, for which I got two inquiries this very week. We even had a pumpkin ranch, but I don’t want to talk about that because advertising costs exceeded income. I also don’t want to talk about our horse-breeding operation because our stud has been transformed from a stallion to a gelding. He doesn’t want to talk about it either. Today we just “launched” a new venture — The Cross Creek Ranch Yacht Club and Marina. We are branching out from the horse facility operations. We are going nautical. The rains and flooding in Colorado have been devastating for many people, so I do not want to make light of suffering of others. I am writing to report a new lake and, as an example of making lemonade from lemons, to envision a new business opportunity. We looked out our bedroom window and saw a large lake that was not there last week, prior to the rains of Biblical proportion. Therefore, those of you who own yachts will be interested in this opportunity to join the yacht club and get in on the ground floor. I will give you a real good deal, but don’t delay, this is a limited time offer. It might dry up again. Beau, who enjoys living on the beach, would welcome some neighbors. By the way, members of the yacht club and residents of the beachfront community are allowed to bring dogs, provided they can swim. Sugar and I had cabin fever, so we called our friends, Rodney and Debra, to see if they wanted to meet at The Forks. They did. I have written about The Forks previously. It is like an old general store in that folks can meet there, get a treat, and sit on the front porch. Tourists stop by too. So Rodney and I, together with our hot trophy wives, ate ice cream cones on the porch. I had a Jack Daniels cone. Yes, that is one of the ice cream flavors at The Forks, made by Walrus Ice Cream in Fort Collins. Rodney and I were each wearing a cowboy hat. A man who was also wearing a cowboy hat joined our group. He kept getting calls on his new-fangled cell phone. He explained that he was there to meet some people from New York. We talked about a mare that he had for sale. Sugar was interested in the horse because of its bloodlines. As we talked, the cowboy with the mare for sale got two or three more calls. “I’m right here waiting for you. Where are you?” we heard him say. “They said they will be here right away but they don’t even know where they are. How can they know how long it will take if they don’t know where they are? Boy, are they dumb!” He couldn’t get over how dumb they are. After about a half hour, we were fixin to leave. The New Yorkers had still not arrived. As we were getting up, the cowboy awaiting the New Yorkers was irritated by another call from them. He told them that he was tired of waiting. At that point, we got nosy enough to ask why he was meeting them. The cowboy got a sly look and confided with us that they were bringing him a check for $2.5 million. Sugar commented that she would wait a little longer if they were coming to bring her a check for millions, even thousands, even $10.00. The millionaire cowboy got a strange look on his face and left immediately. He did not even say goodbye. Rodney just might be on to something. Boy, were those New Yorkers dumb!